JHW has ordered 5 × 85,000 m3 Very Large Ethane Carriers (VLECs) for a JACCAR/Hartmann Reederei joint venture, called UEC (United Ethane Carriers); each vessel will be powered by a single MAN B&W 6G60ME-GI main engine. Dalian Shipbuilding Industry Offshore Co. Ltd. (DSIC) will construct the vessels in China, while Hyundai Heavy Industries (HHI) will build the engines in Korea. Delivery of the first carrier is scheduled for the middle of 2017. The engines will meet Tier III emission requirements with the aid of MAN Diesel & Turbo’s EGR (Exhaust Gas Recirculation) technique. They will feature an injection pressure of 400 bar and form the main part of a propulsion system that also features a MAN Diesel & Turbo Alpha controllable pitch propeller. The ME-GI engines will drive VBS1810 propellers, which are the largest Mk 5 models (diameter 7.6 m) ordered from MAN Diesel & Turbo’s propeller portfolio to date. To maximise efficiency, the propeller plant employs propeller blades of Kappel design, as well as a fairing cone/rudder bulb system. MAN Diesel & Turbo is also providing each vessel’s shaft-alternator system. Upon construction, the vessels will be the largest ethane carriers ever constructed. MAN Diesel & Turbo also reports that it currently has eight ethane engines on order. The JHW order stems from a letter of intent signed by Hartmann Schiffahrts Gmbh & Co. KG, Jaccar Holdings, HB Hunte Engineering and DNV GL at the SMM 2014 trade fair. 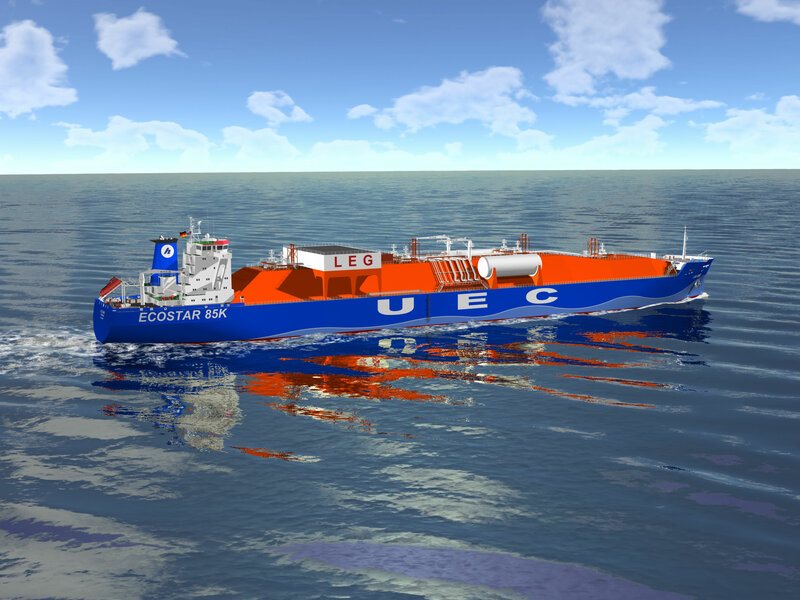 The newbuilding ethane carriers form the basis for United Ethane Carriers, a new ethane venture that the Hartmann Group is developing with Jaccar Holdings of Luxemburg for which long-term charters have already been secured. The vessels will also feature another world-first in the form of their innovative ‘Star-Trilobe’ tanks that consist of three cylinders combined into one. Due to better utilisation of the space in the cargo holds, this results in higher efficiency and allows an increase in cargo capacity of nearly 30% over similarly-sized vessels with conventional tanks, reducing shipping costs through greater economies of scale. The ME-GI engine represents the culmination of many years’ work. Depending on relative price and availability, as well as environmental considerations, the ME-GI engine gives shipowners and operators the option of using either HFO or gas – predominantly natural gas. MAN Diesel & Turbo has also developed an ME-LGI version of the new technology that is capable of operating on methanol, and is currently developing an ME-LGI version capable of running on LPG. MAN Diesel & Turbo sees significant opportunities arising for gas-fuelled tonnage as fuel prices rise and modern exhaust-emission limits tighten. Indeed, research indicates that the ME-GI engine delivers significant reductions in CO2, NOx and SOx emissions. Furthermore, the ME-GI engine has no methane slip and is therefore the most environmentally friendly technology available. Ultimately, the ME-GI engine represents a highly efficient, flexible propulsion-plant solution.